Abu Dhabi, UAE – February 5, 2019: The talented young Emirati karting driver Rashid Al Dhaheri carried out a magnificent and convincing victory during the final of the Mini class at Adria Karting Raceway. The race culminated with Rashid surging ahead of the competition to put a huge three-second gap between himself and the pack of drivers chasing him. This decisive victory placed him first out of 86 drivers from 30 countries with Parolin Racing Kart. The playing of the UAE National Anthem at the podium and raising of the UAE flag saw Rashid becoming the first Emirati to win a WSK race, the highest international karting level. Winning three out of five races in the heats, the ten-year-old’s performance over the course of the weekend was initially strong, however he faced setbacks with his battery which needed attention from a Marshall, which meant that Rashid didn’t warm up properly. Furthermore, the prefinal saw further challenges with engine issues, which concluded with a fourth-row start at the final, creating a significant challenge. Cold, rainy and windy weather proceeded the entire weekend including during the final, as the stage was set with adverse weather conditions. As the competition got underway, despite starting in the difficult outside P8 position, a determined Rashid gained such phenomenal speed that he overtook seven drivers over ten laps. With the young driver powering ahead to victory as the checkered flag waved, Rashid made a Kung-Fu hand sign to greet his Father, who is working in Beijing. The WSK Super Master Series took place on the innovative FIA approved Adria Karting raceway. This 1,302m course is challenging with its tight and twisty nature, with the straights connected by a series of hairpin bends. The WSK Super Master Series will be back on track in three weeks in South Garda Karting (Lonato). 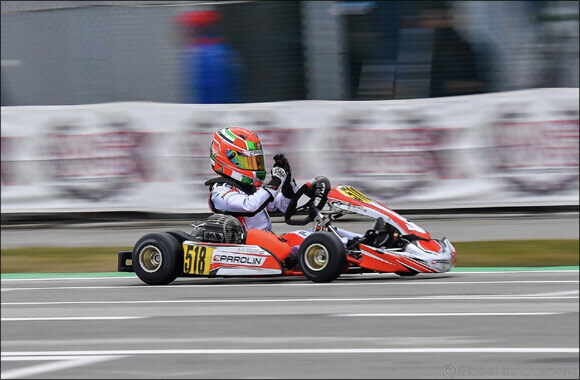 Rashid joined Parolin Racing Kart at the start of this season for World Series races participation including WSK Karting series in Europe, Italian Championship and many others. Parolin Racing Kart specialises in racing and rental karts, components, accessories and engines. Parolin’s innovative spirit and creative approach in finding new technical solutions has helped it to widen a presence worldwide. The company is now known extensively as one of the most important and youngest kart manufacturers.